"They have intentions to intervene militarily," said Attiyah. “They tried to provoke the tribes. They used mosques against us. Then they tried to get some puppets to bring in and replace our leaders,” he added. Attiyah, who traveled to the United States last week and held talks with his US counterpart Jim Mattis, described the beginning of the crisis by the Saudi-led bloc as an "ambush" that was "miscalculated." Asked about Qatar’s relations with Iran, Attiyah said that Qatar maintained "friendly relations with everyone." The Qatari defense minister said that the Saudi-led bloc had “failed” in its attempt to replace Qatari Emir Sheikh Tamim bin Hamad Al Thani with a new leader. "They put their puppet, [Sheikh Abdullah bin Ali Al Thani, a relative of a former Qatari emir], on TV," he said. “They can't do anything. The Qatari people love their emir," he noted. Back in June, Saudi Arabia , Egypt, Bahrain, and the UAE imposed a trade and diplomatic embargo on Qatar , accusing it of supporting terrorism, an allegation strongly denied by Doha. The demands included closing the Al Jazeera broadcaster, removing Turkish troops from Qatar’s soil, scaling back ties with Iran, and ending relations with Egypt’s Muslim Brotherhood movement. Amid the diplomatic crisis, Abu Dhabi has taken an especially tough line towards Doha. 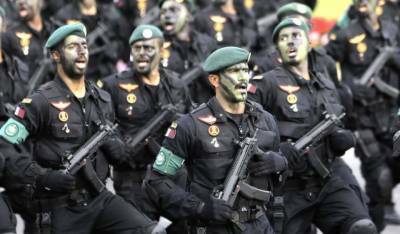 The Qatari former deputy prime minister, Abdullah bin Hamad al-Attiyah, told Spanish daily ABC last October that the UAE had planned a military invasion of Qatar with thousands of US-trained mercenaries, but it failed to secure the support of Washington. A series of leaked documents revealed in November 2017 that the UAE had a stunning detailed plot to launch an economic war on Qatar . Dubai security chief Dhahi Khalfan also once called on the Saudi-led coalition involved in a deadly military campaign against Yemen to bomb Al Jazeera.